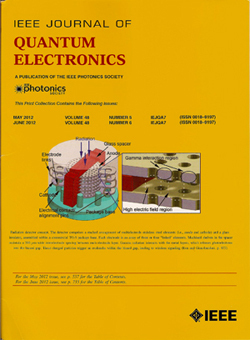 IMAGE: This is a concept drawing of the radiation detector, featured on the journal cover, which incorporates wireless signaling. U-M grad and research fellow Dr. Christine Eun (BSE MSE PHD, EE ’04 ’06 ’11) and Prof. Yogesh Gianchandani describe the diversity of applications possible for sensors based on microscale plasmas (or microdischarges) in the paper, “Microdischarge-Based Sensors and Actuators for Portable Microsystems: Selected Examples,” published in the IEEE Journal of Quantum Electronics, vol. 48, no. 6, and featured on the cover of the May-June print issue. The authors describe the use of microdischarges for transduction in microfabricated sensors and actuators. Microdischarges are attractive because they can provide relatively large signals even as the size of the device is reduced; they are also less sensitive to temperature than most of the conventional options. Some of the applications that are being explored for sensors involving microdischarges include the chemical sensing of gases and liquids for environmental monitoring, medical diagnostics, and space exploration; pressure sensing for oil exploration and subterranean mining; and radiation detection for homeland security. In each case, there exists the possibility of manufacturing the devices commercially in a cost-effective manner. 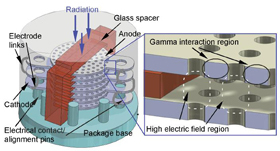 Though a number of research challenges remain to fully realize the potential of microdischarge-based devices, the authors’ work in this area demonstrates the promise of this technology, and shows that the resulting devices will yield practical benefits to society.